With so many museums to visit you better get a bike! Mark your calendar – the 16th of May is European Museum Night! Visit the museums and let them guide you through the streets of Paris. Here are some examples of what awaits you. On Saturday night (May 16th) the four corners of the city of light shine even brighter. Visit the museums and let them show you around Paris. Get on your bike and enjoy the sights as you make your way from one breathtaking museum to the other. Museum of Natural History and a return to our ancestry. After a fresh glass of water, go from the relative quiet of the museum-jungle and make your way along the illuminated banks of the Seine (bike paths) through the lively Latin Quarter to the busy urban world of The City of Architecture: How many lives does a building have? And then visit the ‘Molding Gallery’ to ”experience and learn with your hands”. Close the visit right on time and be charmed by the 20,000 seductive lights of the Eiffel Tower. If you’re itching to move get on your bike and set a course that takes you beyond the norm. At 1pm visit Mac Val d’Ivry (Contemporary Art Museum of Val-de-Marne). At 5pm experience the spontaneously inspired creations through gestures and movements or at 6pm with ‘An improvised created visit’. 9:30pm) before arriving at the newly-opened (already famous) Fondation Louis Vuitton. Finally, return to what you love about Paris and the recently re-opened Picasso Museum. At 8pm and 8:45pm enjoy a choreographed parade and starting from 9:30pm a ‘projection-mapping’ invites you to the l’Hôtel Salé and its star host. A memorable white night with Paris Bike Tour ! Paris Bike Tour wishes everyone Happy Holidays! Nuit Blanche 2017 – Your guide : Paris Bike Tour ! 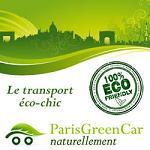 Electric Bike Tour Paris ! Arrival of Tour de France with Paris Bike Tour ! Daily from 9:30 a.m. to 6:30 p.m.
Wow what a fabulous way to see so much, learn so much and enjoy. Great value for the amount of Paris we got experience. We strongly recommend this tour company and their guides. Thank you so much for a wonderful day. For a group with varied cycling skills, felt very comfortable and had a great time with Virginie showing us Paris. Riding around Place de la Concorde was not daunting as I expected, and, as with many other sites, could stop and have a better look. Many thanks! What a lovely afternoon spent with a fab guide who clearly loved her job. She was able to conduct the tour in English and French.I would recommend this tour for all ages. The company does provide helmets for those who want same.